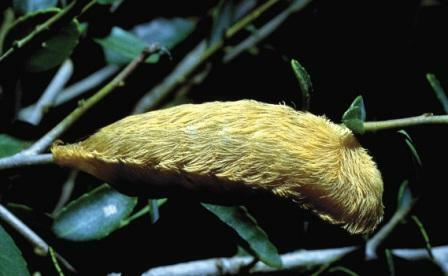 Region: This Caterpillar is found in southeastern United States. Life cycle: This insect produces one generation each year, and overwinters in cocoons attached to tree branches. Physical description: This 1-inch long, broad, flat caterpillar is green to brown with long white to reddish hair that covers stinging spines. The adult moth is beige with dark markings and a wingspan of 1 inch. The eggs are laid on the foliage or bark of plants. Similar insects include the Fall Webworm, Saltmarsh Caterpillar, and the Yellow Woollybear. Feeding characteristics: This pest attacks some ornamentals, but can be found on orchard trees. The larvae feed alone on the foliage, but do not harm the plant. Controls: No controls are necessary. DO NOT touch this caterpillar, there spines are very poisonous. Copyright © OrganicGardenInfo.com All rights reserved.